Welcome to the home on the Internet of composer, arranger and musician Anders Rydholm and his company GodisPåScen AB. 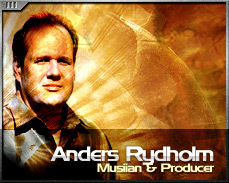 Anders have worked with audio for Television since 1985 and with editing and cameras since 1990. A top modern digital studio is also a part of the company. Check it out here! Grand Illusion are back with a new album for 2011; Prince of Paupers. Anders has produced the new Demon Kogure album that will be released in March 2012.